Cary Grant (18 January 1904 – 29 November 1986), born Archibald Alexander Leach, was an English stage and Hollywood film actor who became an American citizen in 1942. With his distinctive Mid-Atlantic accent, he was noted as perhaps the foremost exemplar of the debonair leading man, not only handsome, but also witty and charming. He was named the second Greatest Male Star of All Time of American cinema by the American Film Institute. I occupy myself as best I can. I really am a happy, amusing fellow at heart. Trouble is I seem the only one left. I’m prepared. I have a gun and I know how to shoot, and whoever comes calling without an invitation will get it in the rear end. Do not blame others for your own mistakes. … YOU are Mother Nature. You have the power within you to be thin or fat, as you desire. … God is within you, and you can do and have anything you want. You must love yourself more. … and then … you can love your fellow man. Don’t go to extremes. Don’t hate too much and don’t love too much. Try to live somewhere in the middle. Hate destroys the hater. And if you love too much you get too involved and you cannot see too clearly. Love and hate are like night and day. They do exist together and you must accept them both, but you must also understand them and be in control of both emotions. It is peaceful in the middle. You won’t be hurt in the middle. Anyone can do well … It’s all out there waiting for you to take. But first you must reach out and get it. You must work for your riches. You cannot expect it to fall into your lap. You must learn to live within yourself … You must establish the values by which you live. You must first recognize the need, and if it is right you will be amazed at how things will open up. When I’m married I want to be single, and when I’m single I want to be married. I never dwell on past mistakes… There is too much to plan for the future to waste time complaining. Elsie Mendl was a great friend of mine for many, many years. And I remember the creed by which she lived: Never complain, never explain. Just think of the people you know who are always explaining their mistakes. It merely rubs the whole thing in. You’re reminded again of the mistake. And no one believes the explanation anyway. It always amazes me that those who fight for the luxuries of life, are the first to resent those who have them. Also, people seek targets for whatever hurts them, especially their own lack of success. Personally, I regard every knock as a boost. Love – that is a word you hear often when you are around Cary Grant. … It seems to me that the whole world is his friend. And he is a friend to everyone – when they need one. As Ingrid Bergman did at the time of her out-of-wedlock baby with Rossellini. 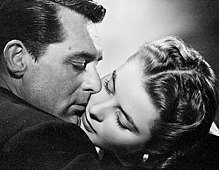 Cary spoke out for her as he would speak out for anyone he admired, whether it was Ingrid, the President of the United States, or a scrubwoman. He is a potent force for good – for Hollywood, and for all of us. I am always delighted to see Cary Grant, and count myself lucky to be one of his friends.